As cities across the world seek to revive themselves from the view of sustainability, taking into account both the environment and aging populations, there is a clear realization of the demand for local transportations that are both comfortable and affordable. When Uber became a successful on-demand taxi startup, every transportation company wanted to leverage their business with an on-demand platform to strengthen inbound leads. On-demand transportation technology that dynamically allocates the vehicle to a different form of transportation, such as either a taxi or carpooling, depending on the customer’s need. The customer can able to choose the type of car as they wish to use among various alternatives, while transportation business owners can increase earnings at the same time. 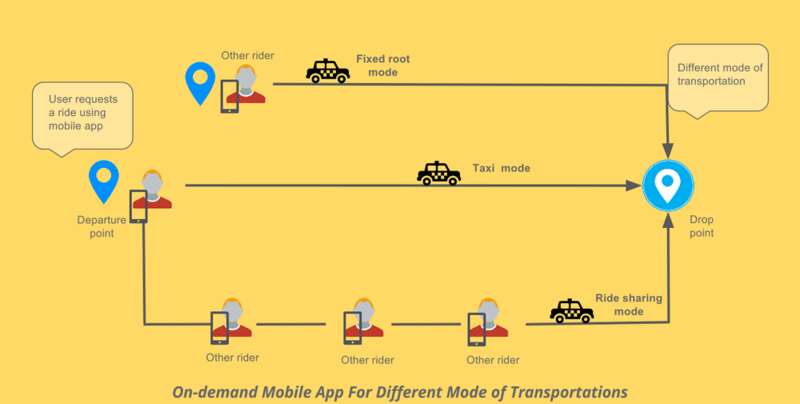 With this on-demand, a conventional or taxis can be dynamically assigned to operate in taxi mode, ride-share mode, or fixed-route mode. Passengers notify service operators of ride requests using smartphones and are given with options for transportation mode, pick-up location, destination, & fare details. This makes the system responsive to a variety of transit needs. Rohan Gilkes, the founder and CEO of Launch 27, an online booking platform that provides the technology for on-demand local business, points out that the success of Uber is in its technology. “There is nothing innovative in running a taxi business. But making it on-demand for customers is innovation. This is a disruptive model that will become mainstream across multiple industries like maid service and lawn care over the next few years as millennial demand more simple online booking and instant scheduling”, he says. Whether you want to set a platform for your own cabs or manage affiliated fleets, TaxiMobility provides end to end solution for transportation business needs.